Nicolas Anelka, friend of anti-Semitic comedian Dieudonne M'Bala M'Bala, makes Nazi-style gesture during soccer game; media shocked. Politicians and Jewish leaders expressed outrage as French soccer player Nicolas Anelka Saturday, after he made a post-match gesture many interpret to be a modified 'Nazi-style' salute. The 34-year-old striker thrust his straightened right arm downwards while tapping his bicep with the other hand after scoring a goal in a game in Britain between his West Bromwich Albion team and West Ham United. The gesture - an imitation of a salute frequently used by a French comedian friend of Anelka's who has been convicted several times for anti-Semitic public comments - was immediately and widely condemned. "This salute is merely a lesser known Nazi salute and we expect the same kind of punishment to be handed down by the authorities as if Anelka had made the infamous outstretched arm salute," said European Jewish Congress president Moshe Kantor in a statement. Online, a storm brewed, with some Twitter users calling Anelka, a former member of France's national team, "loathsome" and "racist". Anelka himself took to Twitter to try to defuse the row, saying in messages in French and in English: "This gesture was just a special dedication to my comedian friend Dieudonne." West Bromwich Albion's coach, Keith Downing, echoed that in a post-match press conference in which he said the footballer was "totally surprised" by the backlash. Anelka's salute, Downing said, was "dedicated to a French comedian he knows very, very well... He is totally unaware of what the problems were or the speculation that has been thrown around." The French comedian in question is Dieudonne M'Bala M'Bala, who has outraged French authorities and Jewish organizations many times with his frequent anti-Semitic tirades. He has been fined seven times for defamation, insult and provocation to hate, and for racial discrimination. The comic, widely known by his first name, has popularized the straight-arm gesture, which he calls a "quenelle" -- a balled food item made of fish or meat. Although his supporters say it is merely "anti-establishment", it is frequently used by French anti-Semites, many of whom photograph themselves making the "modified" Nazi salute in front of Jewish establishments, holocaust memorial sites and even with unsuspecting Jewish passersby. French Interior Minister Manuel Valls released a statement Saturday in which he said he would seek to ban Dieudonné's performances altogether. "Despite a conviction for public defamation, hate speech and racial discrimination, Dieudonné M’Bala M’Bala no longer seems to recognize any limits," the statement, read, according to France 24. Anti-Semitism in France has skyrocketed in recent years. 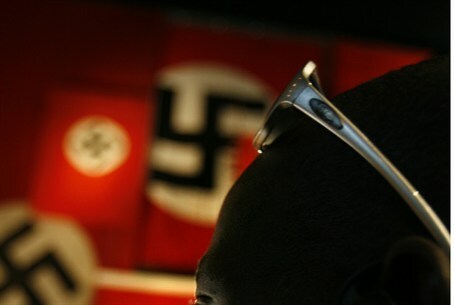 A report found anti-Semitic incidents rose 58% in 2012, with most attributed to Muslim extremists. That year saw the infamous Toulouse shooting in 2012 in which a rabbi and 3 Jewish children were murdered in a shooting-spree by a French Muslim extremist. The Israeli government recently announced a program to help French Jews emigrate to Israel en masse - after reports have surface showing a mass exodus of Jews from France to other Western countries.